In spite of our need to keep in touch via various communication technologies (telephone, web conferencing etc), it's always great to get together in the same room at the same time. Face to face. And there are so many people in ACE e-learning doing great work across the North-West region of Melbourne. The first thing to follow up was from our first activity of the day. We spent some time matching generic software labels with educational or social purpose and then brand names. 2) Description: Application which enables discussion in voice form - not necessarily at the same time. Students can leave a series of voice messages. 3) Brand names: voxopop, wimba. This came up in a previous discussion, where we talked about how people often leap to the brand name, which doesn't help e-learning beginners at all. Ann) "What kind of e-learning are you doing?" Bill) "We're doing google docs." Bill) "Ah, I mean we're getting our students to write collaboratively using web-based writing tools." Ann) "Oh I see. What kind of writing?" Word Doc format for you to edit as you like. (It's in word doc format, but using google viewer: you'll need to save it locally before you can edit the file. 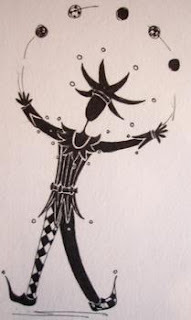 photo credit: (creative commons at flickr) Thanks: Crateva for juggling jack. Thanks for the 'answers' to the match-up activity, Michael. I like the way you can publish this as a Word doc in Google Viewer, allowing people to download and edit as they wish.